Has anyone come across this issue or dealt with ID numbers being exported from a lookup column? Is there a way that I can have the SharePoint list not export the numbers when I 'Excel export' the list? Excel Export: The red boxed ID are the ones that I would not like to include in the Export which are the Lookup columns. All help on this issue would be appreciated. I don’t think that there is any solution for this. 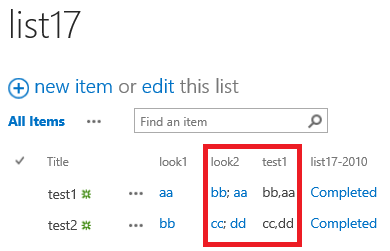 The problem is, that SharePoint has to convert all fields to string which will produce “LookupValue;#LookupId” as can be seen on your screenshot. Turn off the “Allow multiple values” for the lookup column. If you must turn on the “Allow multiple values”, you could use the Substitute formula to remove the "#;#;" in the excel after exporting to the excel. You could create workflow to copy value from the lookup column to single line of text and set as the picture below. Not the answer you're looking for? Browse other questions tagged sharepoint-online sharepoint-designer excel or ask your own question.